We have a wonderful recreational gymnastics program that focuses on the fundamentals of the sport. Children will learn basic terminology and gymnastics skills while improving their strength, flexibility, coordination, agility and self confidence. 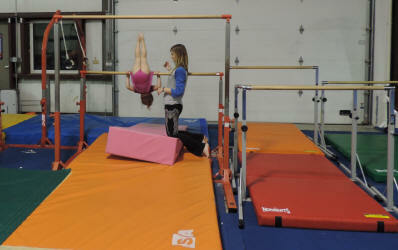 Each child will experience the springboard/vault, bars, beams, floor, tumble trak and the pit! As each level is mastered the child can advance to the next challenging level. Our programs start at age 1 to walking and continue through high school. There is something for everyone! This is an interactive class between parent and child, where the child will develop physically and socially. 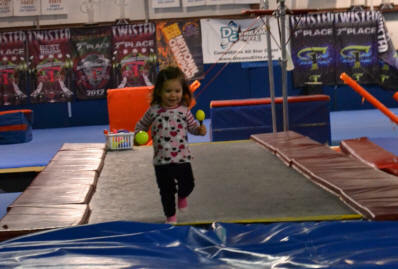 During the class, parents will assist the child with warm-up activities, balance, climbing, swinging and jumping are a few of the activities your little one will enjoy. The structure of this class will expose young gymnasts to basic gymnastics skills while building confidence, independence, and learning skills. The one hour class will follow a circuit format, while learning skills such as forward rolls, handstands, cartwheels, strength and flexibility. 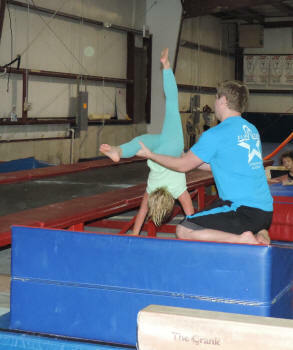 Our tumbling program is geared toward the cheerleader and dancer. Students will work on the necessary tumbling requirements to try out and make a cheer or dance/acro team. Tumblers will work on the basics such as handstands, cartwheels, round offs, flip flops(back handsprings) and back tucks and beyond for the advanced cheerleader/dancer. We have 4 levels so the tumbler may progress with FlipStar over a long period of time. We teach progressions so the tumbler is required to master basic skills prior to working on more advanced skills.